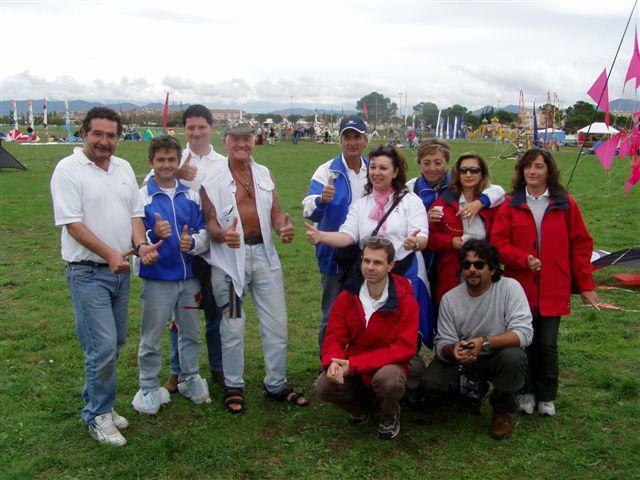 The Theme for this year’s festival in Base Nature, Frejus France was the country of Portugal . There were 380 invited guests from 18 counties from all over Europe plus flyers from Canada , USA , Singapore , Brazil , and Cuba . 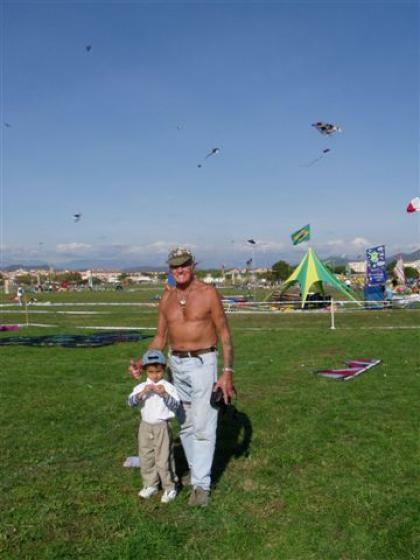 This is also Europe ’s last kite festival for 2004. I arrived in Nice France on Friday and was picked up by my friend and the owner of the hotel where I have been staying for the last six festivals, and the rain was pelting down. His car wind screen wipers could not keep up with the downpour, but by the time we arrived at Frejus which is about a 45 minute drive from Nice it had eased off a lot. 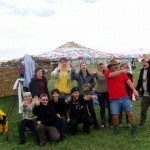 I was very pleased in a way that because of the rain there would be no one at the festival site. It was great to sit back and relax, sipping on some of France ’s fine wine after a long flight. 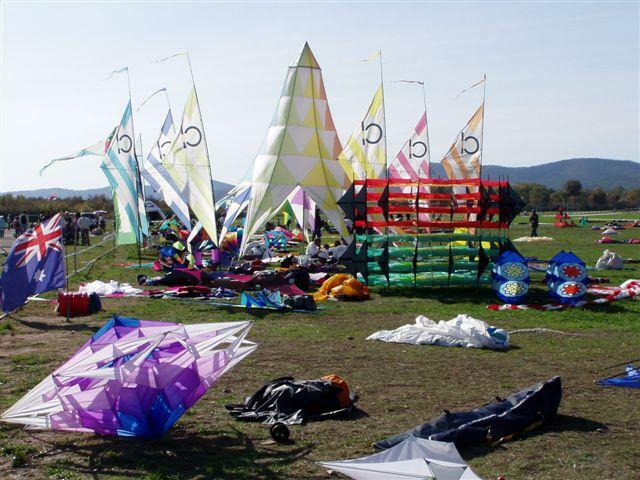 On Saturday, the first day of the festival was a beautiful sunny day with a perfect 8-10 mph wind, and the sky over the huge festival site was a mass of kites of every description from the giant Mega Ray to the smallest diamond kite. 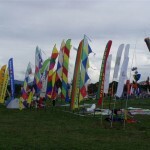 The Sport Kite demonstration arena was on the go all day, and some great performances were given by pairs, team and individual sport kite flyers, which were greatly appreciated by the hundreds of spectators. 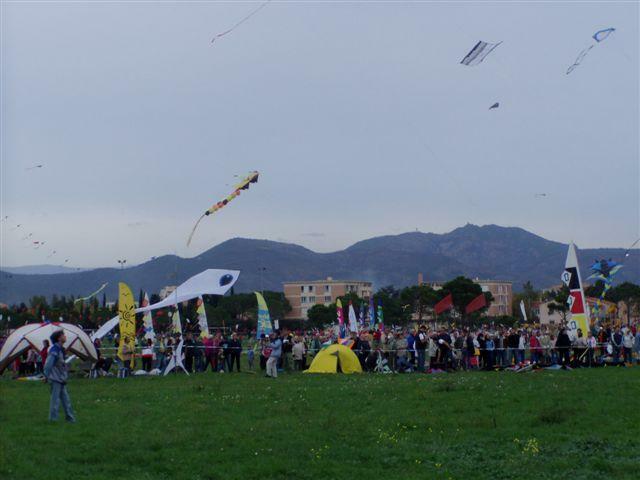 Just like all of Europe ’s kite festivals, it was well supported by the local people. 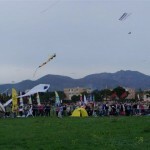 Sunday, the second day of the festival, it was just like Saturday until around noon when it clouded over and the wind stopped and it started to rain a little, just enough to make the spectators disappear and all the single line kite flyers to pack up their kites before they got soaked. But all was not lost as it was a great day to catch up with old friend and make new ones. 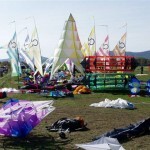 This festival is great for that, especially with all the Italian kite flyers, as they always seem to come prepared for days like this, being well stocked with all kinds of goodies, wine, cheese, etc to share with everyone. 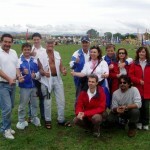 As I have mentioned so many times in my other articles about this festival that it is very family oriented. 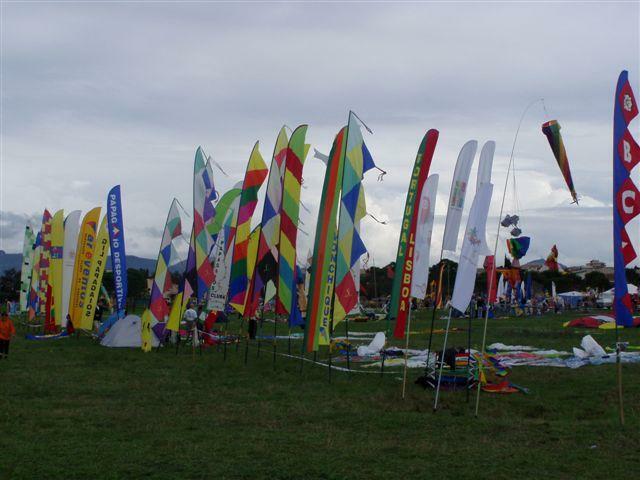 In fact it is much more than a kite festival. 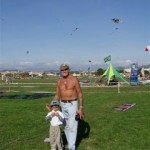 It is a huge family gathering and the kite flyers all over Europe are one big family. It is like Thanksgiving without the Turkey. Hotel L’OASIS sponsored me to stay at their hotel, not only for the three day festival, but for as long as I wished to stay. It was indeed an offer I could not refuse after such a very busy year. It was a great opportunity to relax, so I stayed on for another seven days. The hotel is owned and run by a husband and wife, two very beautiful people, Isabelle & Gabriel Specht, and just like the last six years that I have stayed at their hotel, I was treated like one of the family. 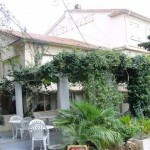 The Hotel is a very pleasant, warm and very friendly place. The same people return year after year. It is also perfectly situated in a very quiet area surrounded with shade trees yet it is only a 5 five minute walk to the beach and just a short distance to the town. 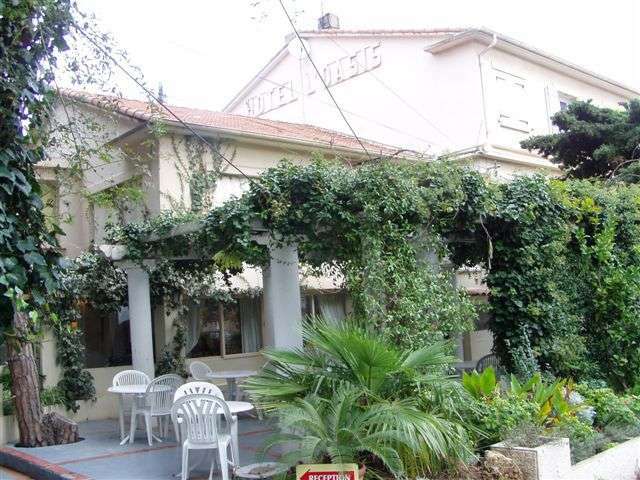 It is an ideal hotel to stay in while vacationing in Frejus. As I have said, this was my sixth year staying there and I highly recommend it, and it is a good place to relax. 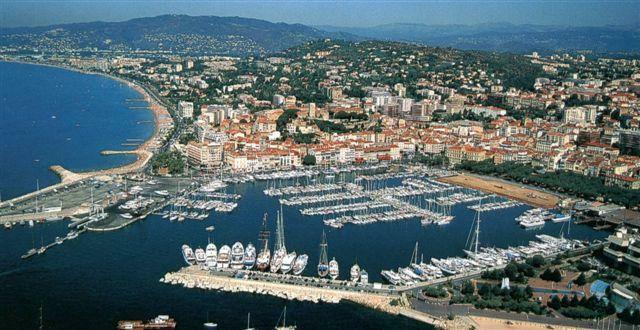 I surely did as Frejus is on the French Riviera, which is 120 miles long from Bandoc all the way to Menton. 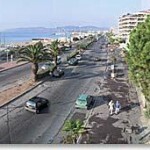 The drive, which I have done many times, is stupendous, which follows the continuous winding road of the coastline. The brilliant Blue Mediterranean is never out of sight. 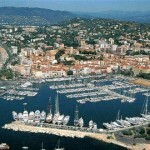 It is no wonder the rich and famous choose the French Riviera to relax and do their thing. I really liked the old town of Frejus because it has a beautiful charm of its own with its narrow streets and pastel house-fronts. 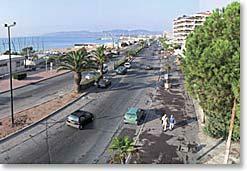 Ancient Romans erected some of the buildings. History is evident around every corner. The market places are filled with scents of every kind. Fruit and vegetables abound, and the brilliant colored stalls are piled high with garlic and olives, which are the basic ingredients of the local cuisine. One of the things I liked while strolling through the town was it is a great reminder of the Roman past, which was founded in the first century AD. I would like to thank the two people that so kindly sponsored me with airfare and my two very dear friends for not only inviting me stay as a special guest at their Hotel but also for their hospitality and friendship. 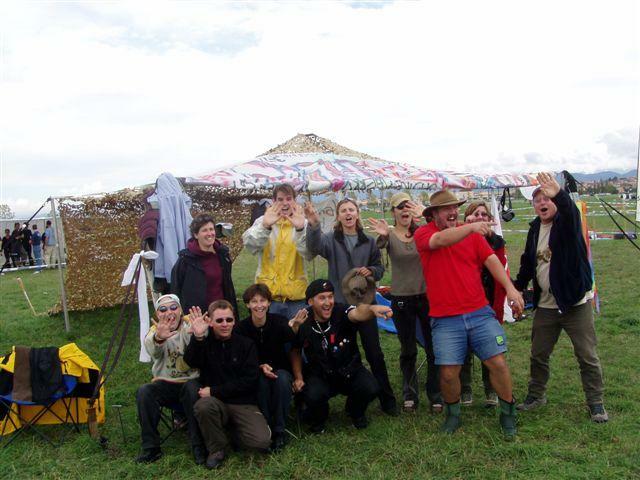 This entry was posted in 2004, Events / Festivals, Issue 39 (Nov/Dec), KL Archive, Reports and tagged de l'air, festival, France.